Here's a quick run-down on yet more new releases that have tickled my fancy in the last week or two. 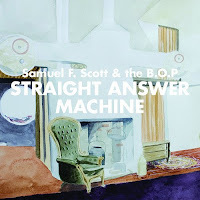 Samuel F. Scott will be best known to you as one of the chief songwriters and a singer in the Phoenix Foundation. Hot on the heels of the Phoenix Foundation's fantastic third album, Happy Ending, Scott has just released a second album under his own name, this time with his band Bunnies on Ponies or B.O.P. Straight Answer Machine will appeal to Phoenix fans but has it's own distinct feel. Scott isn't afraid to try out ideas but avoids the sort of stylistic lurches that were found on the solo album of fellow Phoenix, Luke Buda. There's a warm relaxed playfulness to this album that results in songs that manage to both suprise and seem familiar at the same time. A video for first single 'Lleewellyn' is on the video page. The Calico Brothers hail from West Auckland. 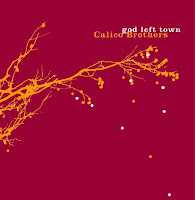 They are three brothers, a cousin and a friend who who have put together a 6 track EP, God Left Town, that is an accomplished pop collection with flavours of Crowded House, classic Californian sounding country rock and John Lennon. Check out a recent live performance on National Radio (stream) and a video of them performing live on the video page. Benka Boradovsky Bordello Band play a kiwi take on Gypsy and Eastern European traditional music of the type that would fuel a night of drunken dancing revelry. Their 5 track EP, danse macabre, is comprised mostly of traditional tunes with one original, 'Dance of Death'. 'Serenade' is the standout tune from This Machine, an EP by duo Naked and Famous. The EP mixes snatches of indie rock, trip hop and electronica and for four of it's five tracks is really good, but Serenade is something different again - a great exuberant exciting pop song that should top the charts. It has also been released on limited edition seven inch single. And finally, Tiger Tones, a young Christchurch band who sound as if they have swallowed and regurgitated the Rough Guide to Post Punk, as edited by NZ's Shocking Pinks and New York's LCD Soundsystem. Listen to their self titled album and you will hear snatches of New Order, P.I.L., The Cure and, even Orchestral Manoeuvres in the Dark but all with a 21st century spin. On their myspace page they even cite the Shocking Pinks hi-hat sound as an influence. I'm enjoying this album a lot and looking forward to hearing how they develop in the future.